The Newborn Screening Statute applies to all births in Wisconsin. Due to the life-threatening consequences for some of the disorders, it is recommended that the specimen be collected between 24 and 48 hours of life. If the initial specimen was collected before 24 hours of life, obtain a repeat specimen at 48-72 hours of life. Collect an initial specimen at 24-48 hours of life. Always collect an initial specimen before a transfusion or other treatment (except respiratory) occurs. If this specimen is collected prior to 24 hours of life, collect another specimen at 48-72 hours of life. 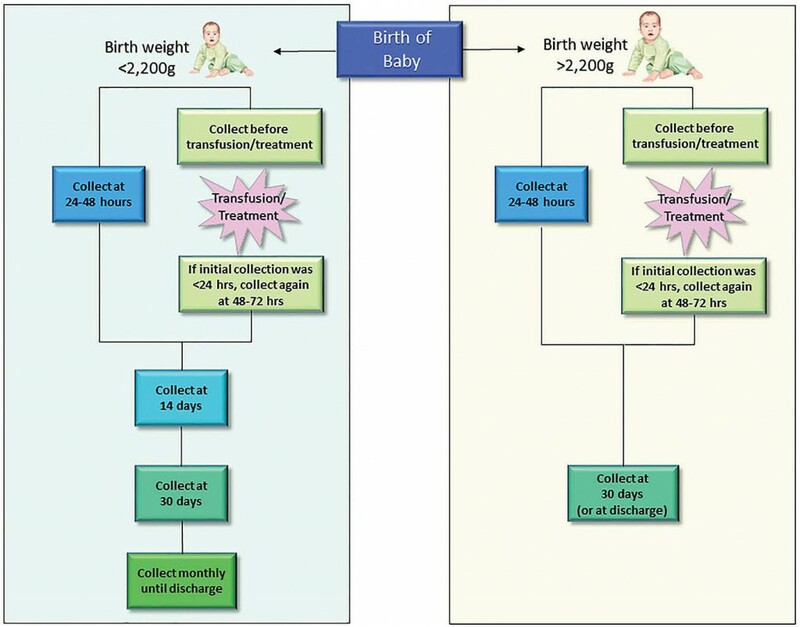 For infants with a birth weight <2,200g, collect a second specimen (third specimen if infants initially tested at <24 hours of age) at 2 weeks of age, a third specimen (fourth specimen if infants initially tested at <24 hours of age) at 28-30 days of life or discharge, whichever comes first, and monthly thereafter until discharge. For infants with a birth weight ≥2,200g, collect a second specimen (third specimen if infants initially tested at <24 hours of age) at the time of discharge or at one month of age, if hospital stay is longer than one month. NOTE: If any of the collections occurs post-transfusion, follow re-testing guidelines stated on the laboratory reports. If screening results from any of the collections place infant at high risk for a condition, follow the recommendations stated on the reports. Red blood cell transfusions, including extracorporeal life support (ECLS) can interfere with newborn screening test results. It is recommended to always collect the initial newborn screen prior to transfusion. If initial specimen was collected post-transfusion, collect a second newborn screen at 60 days of life (and greater than 14 days after last transfusion). If initial specimen was collected before transfusion and less than 24 hours of life, collect a second specimen at 48-72 hours of life and then a third specimen at 60 days of life (and greater than 14 day after last transfusion). Total parenteral nutrition (TPN) is administration of nutrients, intravenously, to reduce nutritional deficits and maximize growth. TPN contains amino acids, carnitine, and/or medium chain triglycerides that can interfere with newborn screening test results. It is recommended to always collect the initial newborn screen prior to administering TPN. If initial specimen was collected after TPN administration, collect a second newborn screen 4-24 hours after TPN has been discontinued. If initial specimen was collected before TPN administration and less than 24 hours of age, collect a second specimen at 48-72 hours of life and then a third specimen 4-24 hours after TPN has been discontinued. It is recommended to collect the newborn screen at 24-48 hours of life. If transfer of the infant to a different medical center will occur prior to 24 hours of life, complete the NBS card and fill in the “Blood Not Screened” box. Be sure to inform the receiving hospital of collection status. The receiving hospital will assume responsibility for collection of the screen at the appropriate time frame (24-48 hours of life or prior to transfusion or TPN administration).